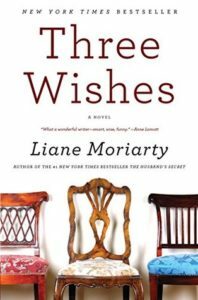 This is the first book by Liane Moriarty that I have read, and I’m definitely looking forward to reading more of her work. She manages to capture the struggles of daily life, for upper middle-class, white Australians yes, without dropping too heavily into melodrama and angst. The sorrows and tribulations of these characters never felt forced or clumsy and each event progressed naturally from the last and she does it all with a deft, light touch. This is mostly highlighted because the book I am currently reading does not do those things at all, and the contrast is pretty high. This book follows a set of triplets through one year in their life. In their early thirties, the Kettle sisters seem to have it all. However, lurking behind their beautiful facades lurk some pretty heavy secrets and troubles. The book starts with a scene in a restaurant, from the point of view of several onlookers, where the three sisters collapse violently on each other. The rest of the novel, told from each sister’s point of view, recounts how exactly the sisters got to that point in the restaurant. There are also brief interludes as strangers recount their brief interactions with the sisters. I liked these interludes a lot as they showed how the perfect image of the three sisters was seen by strangers, as we delve into things we learn that those perfect images weren’t always so perfect. I’m trying to figure out why I can’t really give it more than three stars because I do think it’s a very well written book and one of the better ‘chick-lit’ books that I’ve read. (I hate that designation, it is often used to denigrate perfectly fine novels because they tell women’s stories but that is where the book fits) I really did like the book but the moment I think about rating it higher I start to balk because, I did not ‘really like it’. Personal preferences being what they are, this is a three and a half star rating for me, and pretty firmly in three star territory. I liked it, it’s good, and I recommend it. Share the post "The Fiercest Enemies, The Closest Friends"
This is a cute one, but not one of her best — which means it’s a great way to start! Oh that’s good to know. I think I have Big, Little Lies on my kindle waiting to be read. I also gave it 3 stars. I liked it, but I didn’t. I didn’t like any of the sisters as people even though I empathized with them at times. And I agree with badkitty, she definitely has better ones out there! BLL is fabulous and fun. Enjoy your first time through!